Twenty years ago, a favorite children’s story hit the Broadway stage in a colorful, musical adaptation that sailed to eight 1991 Tony Award nominations and won three of them. 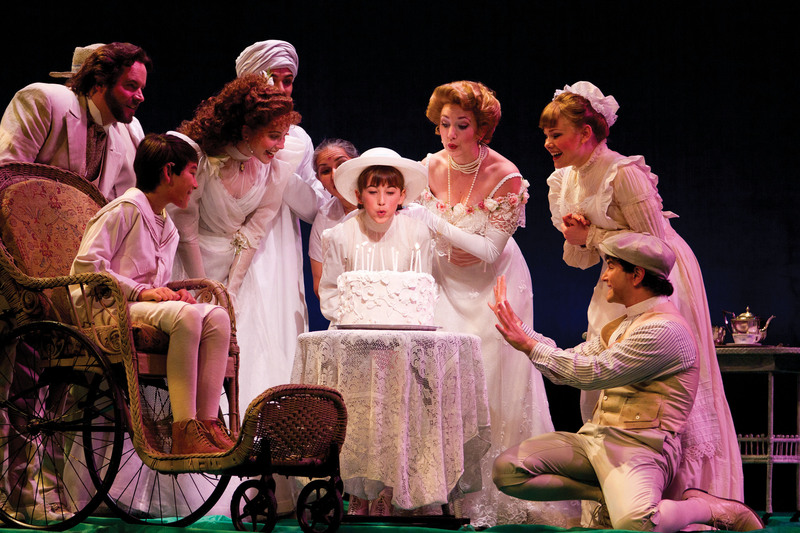 The story was “The Secret Garden”, and it has delighted audiences since its debut. The musical isn’t completely true to Frances Hodgson Burnett’s novel of the same title, although the basic storylines match. The primary differences in the musical compared to the novel are a growth of the adult character roles, a slight shift in the family tie through Mary’s mother not her father, and some invented increased entwining of the Lennox and Craven families. The musical’s story follows Mary Lennox, a cholera survivor who’s orphaned in India when her parents and nanny die of the disease, who is sent to live with her uncle Archibald Craven, her only surviving relative. We find that he too has suffered a great loss. His wife Lily, Mary’s aunt, died in her special garden ten years earlier during childbirth after falling off a tree limb that broke and sent her into early labor. Craven is cursed with a hunchback and is both physically crippled and grief-stricken. He has locked the garden away from world and left it to rot, unable to face it and is tormented by his longing for, and memory of, his departed wife. He has also, on the advice of his brother Neville, his son Colin’s doctor, kept Colin locked away in bed since birth, afraid that he had inherited the curse and was crippled as well. Mary, of course is drawn to Colin, and to the garden, befriending many of the servants along the way, eventually bringing life back to Craven and his son as she restores the garden to its rightful glory. The story is largely fantasy, with the ghosts of the departed forming a Greek chorus chronicling the action in song. TheatreWorks first produced “The Secret Garden” in 1995, and has now returned to this old favorite to enliven the holiday season with its theatrical magic. And a stunning display it is, especially impressive given the small stage at the Lucie Stern Theatre. The result of Joe Ragey’s scenic design is the first thing audience members notice as they enter the theatre seeing trees on the thrust side stages, and colorful panels center stage. Once the show begins, the full beauty of Ragey’s set comes to life, its movement carefully choreographed in an almost ballet-like fashion along several tracks moving framed panels covered in silk, furniture, and of course garden pieces. The silk panels are a particularly nice touch with their translucence allowing for dramatic revealing of much of the action on stage. Additional set constructs include a house model flown in upstage when viewing the house from a distance, with varied lighting as time moves forward through the evening hours. Archways and bookcases are also flown in at appropriate moments inside Misselthwaite Manor. Trees move in, often guided by actors, and other delicate touches are evident, but they won’t be revealed here. Director Robert Kelley brings a talented cast to bear, combining Molly Bell’s choreography and utilizing Ragey’s set, to bring this exciting production to life. The thirteen cast members cover a lot of ground, several assuming multiple character roles, and there are numerous standout performances. Joe Cassidy (Archibald Craven) and Patricia Noonan (Lily Craven) are well matched, particularly striking since Noonan’s character is a ghost. Both also have many outstanding moments with others in the cast and they have the vocal chops for their parts. Cassidy in particular has a glorious falsetto in his more tender moments such as at the end of “Race You to the Top of the Morning” sung to Colin before Craven runs away to Paris. There’s a notable bit of choreography at one point when Cassidy and Noonan are dancing together, not touching, but whirling effortlessly across the stage in a fanciful waltz. The illusion is distorted later in the scene when they continue dancing together in a full embrace. In fact the fantasy/reality boundaries are rather loose in this piece, much of the time with scenes flipping from dreams to wakefulness seemingly indiscriminately. Adam Theodore Barry’s Fakir is an often present spirit called upon in a physically demanding role which Barry negotiates with apparent ease and grace, his character carefully inspiring Mary, and at times guiding her actions. His vocals are particularly nice as well in the opening dream sequence. Alex Brightman (Dickon) is delightful. His earnest playfulness is contagious and his voice pleasant. He and Mary have a nice moment in “Wick” as Dickon explains the concept to her while bouncing amongst the trees, inspiring her to not give up on her dream singing “when a thing is wick it has a light around it”. Courtney Stokes (Martha) is also quite good. Her interactions with Mary are both believable and very entertaining, and her vocals are strong. Her “A Fine White Horse” is a particularly memorable number as she coaxes Mary to explore outside the manor while comically lamenting the chores that she, as a chambermaid, must endure all the while helping her young charge get dressed. Angelina Wahler (Mary Lennox) ably carries a good deal of the show. Being one of only two children in the cast, she relates well to the adults on stage and moves with ease among them. Her melodic vocals are solid, though she has some difficulty holding her harmonic lines. Andrew Apy (Colin Craven) is the other junior cast member, and he too is engaging, though like Wahler suffers a bit on his harmony vocals. The two of them are paired well though, and their stage presence together is believable. Their “Round-Shouldered Man” is a touching duet as they realize their connection. The utilization of the rest of the cast is highly effective. The most striking aspect is the choreography and synchronization with the set movement in the larger ensemble moments as cast members suddenly appear through the moving panels for a line or two of a song, and then quickly disappear. Music director William Liberatore whittled the 19 piece orchestration down to a precious 10 parts, carefully considering the instrumental balance and not losing any of the lushness expected when hearing this haunting score. The resulting orchestral execution is exquisite. Owing to the space-constrained pit, the percussion is heard over the theatre’s sound system as all of the percussion equipment is set up behind the pit, under the stage, the percussionist watching Liberatore via a video monitor. The show is a stunning display, and while it garnered a standing ovation on opening night, the one general negative is that the actors’ microphones are too hot overall. This may be due in part to some of the actors’ inconsistency in their volume control at the edges of their ranges, but the result is that the more powerful singers overwhelm the house at times. One note: this review is from the opening night performance. The roles of Mary Lennox and Colin Craven are double cast, so for selected performances, Rachel Sue and Charlie Ibsen will be covering those parts. TheatreWorks’ production of “Secret Garden” is a solid production and should not be missed this holiday season. The show continues through 31 December (with an option for possible extension) at the Lucie Stern Theatre located at: 1305 Middlefield Road in Palo Alto. See http://www.theatreworks.org/shows/1112-season/thesecretgarden for more information.